Results: While it is important to understand how the Earth system works from a process-level basis, it is clear that human activities are increasingly challenging assumptions about how that system works. Factor in climate change, and it is quickly apparent: one size certainly does not fit all. In their paper, "The Regional Nature of Global Challenges: A Need and Strategy for Integrated Regional Modeling," authors Dr. Kathy Hibbard and Dr. Anthony Janetos of Pacific Northwest National Laboratory make the case for integrated regional-scale analyses, where they discuss how regional dynamic interactions between human and natural systems provide insight into mitigation and adaptation strategies, their tradeoffs and consequences, and how these influence the global Earth system. In analyzing global environmental challenges via models, the scale needs to be relevant to the responses adopted at regional levels and informed by people affected by those decisions. Enlarge Image. Why It Matters: Decision making processes are fundamentally made at regional scales. An integrated approach that accounts for the dynamics of climate, energy, and environmental systems will provide insight into options for how to manage and plan for future under-limited or over-abundant water and/or land resources under climate change. In particular, there is an expectation that progress in technology or commerce is a constant, limited only by human ingenuity. However, much of the things people depend on everyday-energy to charge their cell phones, ample food at the local supermarket, and even plenty of fuel to drive to work or school-are inextricably impacted by climate change. The ability to implement accurate, flexible model simulations to assess interactions between the environment and energy systems can afford progressive response options for those who make choices (and are mindful of risk). The choice to build new power plants; grow crops for food or biofuel; or designate water resource allocations for energy, agriculture, or domestic use affects these sectors in both the near- and long-term. Methods: Increased computing power and exponentially improving climate process models have paved the way for tackling climate-related issues at regional scales, where terrestrial and atmospheric systems can be vastly different from centimeters to kilometers. Moreover, policy decisions focused on climate change must account for changes in energy supply and demand, land and water uses, and socioeconomic conditions that also vary greatly over specific regions. Recently, modeling activities have coupled human processes with detailed representations of climate system dynamics at global scales. To do this on regional scales requires an integrated suite of models that can collectively simulate processes and interactions for regionally specific, multi-sectoral questions and issues. Programs, such as PNNL's Platform for Regional Integrated Modeling and Analysis, or PRIMA, are starting to bridge the gap between regional information and process-level understanding at decision-relevant spatial scales. "It is at regional scales where people care about how their land and water resources are used, whether it's for food or energy production, recreation, or other activities," Hibbard, PRIMA's Chief Scientist, explained. 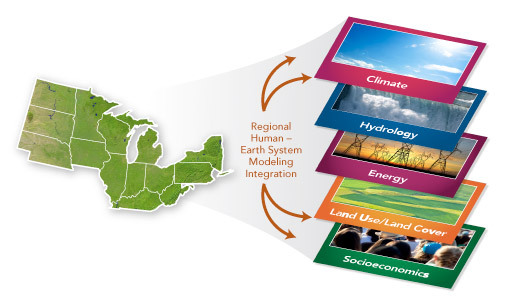 "Developing a flexible and integrated modeling platform that allows for stakeholder engagement and inquiry will enable and inform decision makers on how the unique combination of climate and needs for energy, water, and land may unfold for their region and their future." What's Next? In this effort, Hibbard and Janetos provide four overarching questions that will shape how regional constraints for mitigation strategies are adequately addressed: 1) are there constraints (natural or human-based) that make implementing mitigation options more difficult, 2) how might incremental changes to climate or climate variability affect regional decision making and adaptation strategies, 3) are there are tipping points or thresholds in resource availability under climate change, 4) and what regional adaptation strategies over the next 25-50 years need to be considered? Reference: Hibbard KA and AC Janetos. 2013. "The Regional Nature of Global Challenges: A Need and Strategy for Integrated Regional Modeling." Climatic Change 116(3-4). DOI: 10.1007/s10584-012-0674-3. To make substantial inroads in understanding and effectively negotiating impacts of global environmental changes, there must be some consideration of the dynamic interactions occurring at the regional level with acknowledgement that human activities are increasingly challenging assumptions about how the Earth system works. Developed at PNNL, PRIMA is a unique modeling framework that simulates interactions between natural and human systems at scales relevant to regional decision making. The framework brings together state-of-the-art models of regional climate, hydrology, agriculture, socioeconomics, and energy systems, along with a sophisticated uncertainty characterization approach and analysis and visualization tools. It can be customized to inform a variety of complex questions and decisions, such as planning, implementation, and evaluation of mitigation and adaptation options across a range of sectors. Extensive, active stakeholder research is used to identify issues that drive decision making and to inform how models and coupling strategies are strategically applied. It is expected that PRIMA can have varied applications within DOE-relevant missions, as well as for policy makers, regional planners, the energy sector, and industry.